Most people would do just about anything to avoid having to remove wallpaper. It's rarely a task that makes it to the top 10 "fun things to do" list. But let's face it, when wallpaper needs to be removed, it's got to go. What are some ways to make sure that removing that dated wallpaper doesn't take your sanity with it? Those who tell you they just ripped their wallpaper right off had the walls sealed with wallpaper primer. Hopefully your walls have the same preparation. Priming was more common in the 1990s and prevented the wallpaper glue from soaking into the plaster and making the bond too tough. You can check to see it your walls are primed by loosening a corner or seam with a putty knife and just pull. If it just comes off in a sheet, you're in luck! With well-primed walls, dry stripping should work for the entire job and you could finish a room in a couple of hours at most. 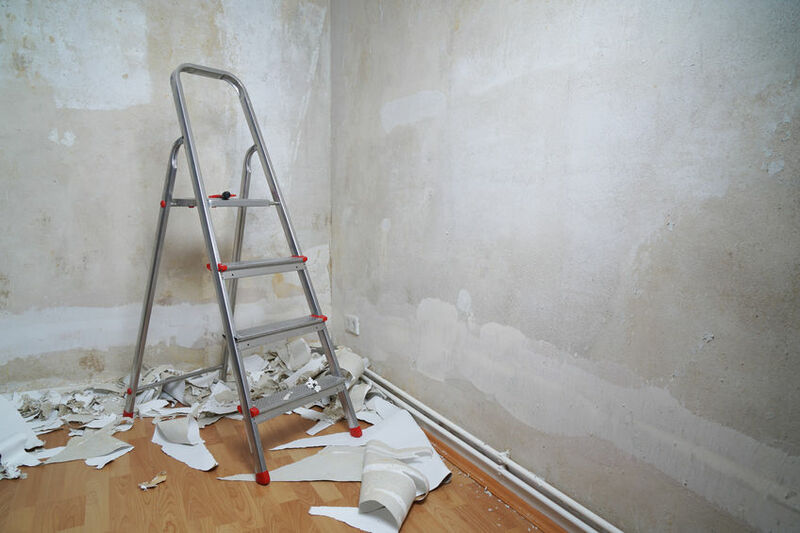 Thankfully, wallpaper glue is water based, so water works wonders in removing wallpaper if your walls aren't primed. It's a technique the pros use, it works so well. Score or perforate the paper and its backing in sections so water can soak through and loosen the glue. The pros recommend a scoring tool called the PaperTiger (under $20) because it doesn’t harm the wall. Douse the perforated paper with hot water using a pump or compression sprayer. The big mistake most people make is using a regular old spray bottle or damp rag to wet the paper. This leads to hours of fruitless scraping because the paper and its backing don’t get sufficiently saturated. The sprayer, on the other hand, gives you the firepower to really soak the glue. Let the paper soak for about 15 minutes and scrape it off with a putty knife. It could take you six hours for an average room, but that’s way better than the days of effort it could take if you don’t know what you’re doing. Why do pros use chemical strippers if water works so well? Because it can dissolve glue faster than water. But the trade-off is the fumes. Plus, water is cheap, so it just makes more sense for DIY. Through the interweb grapevine, you may have heard that fabric softener (diluted with water) is a brag-worthy way to remove old wallpaper. But we couldn’t find a single expert who agrees. Fabric softener just makes the process more complicated, smelly, and even messier than using just plain old water. You end up mixing glue with the chemicals from fabric softener. In addition, fabric softener may harm drywall. So when it comes to removing wallpaper, the happiest journey (assuming your walls aren’t primed) involves water — and patience. Check back on our blog twice a week for more real estate news, ideas, and local events in Austin and Lake Travis. You can search for the perfect home on our website using our powerful home search tools. You can also get free listing alerts of homes as they hit the market at WelcomeToLakeTravis.com. And you can always feel free to call us at 512-657-4467​ to talk to an experienced agent today.